So here we go, off on our tour! As I’ve read these stacks of books over the past months, I’ve thought a lot about how we present global cultures to our children. How do we avoid a sense that people living in cultures so unlike our own are some sort of curiosity on display behind zoo-glass. How do we help children make human connections to what they read about? We want children to appreciate the incredibly varied ways of life around our world. To have a spirit of inquiry and respect for the ingenious, artful, fascinating, ways people live, dress, eat, build, celebrate, play, worship, work. To see how much we have in common. To humbly acknowledge that we might learn a better way from others. To delight in the new and unfamiliar as well as the sweetly similar. At the same time, there are tragic circumstances in our world. Millions of children are born into war zones, famine hotspots, refugee camps, slums, homelessness. How do we nurture empathy? How do we help kids see that no one gets to choose where she’s born? These are questions worth asking, I think. No simple answers. I reviewed a book awhile back that brilliantly delves into the idea of putting oneself in another’s shoes. Since connection is what we want in ourselves and our kids, I am recommending it again. It would make a great segue into a world tour as it encourages us to think, “What if that were my life?” You can read my entire review here. If you read just one book from today’s post, I’d recommend this one. Gorgeously illustrated. Authentically researched. Diverse and engaging. It’s a gem for ages 4 and older. Seven real children from around the world took part in this project, sharing the details of their families’ lives with the author. Through their explanations and Lamothe’s fabulous artwork, you can walk through a typical day in the life of families from Peru, Russia, Japan, Uganda, Iran, Italy, and India. 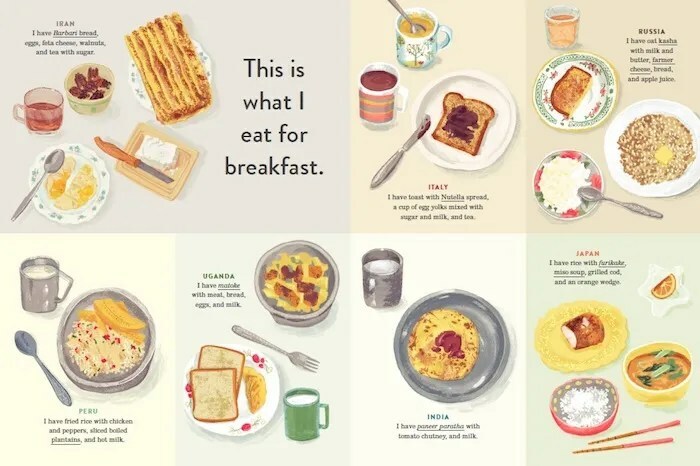 Find out what kind of house they live in, who makes up their family, what they wear to school and eat for breakfast, how they learn, play, work, and much more. Clearly there are wide varieties of families and ways of life within each of these countries. These narratives, however, so rich with cultural detail, are a brilliant starting point for discovering the fascinating differences and lovely similarities between ourselves and others. One of the best books I’ve seen for connecting kids to the world. Highly recommended! A lovely choice for the youngest of our world travelers, this collection of striking photographs of children simply going about their day is accompanied only by brief captions. Kerley’s words unobtrusively guide us through the day, welcome us into these different lives, give some context, without getting in the way of really lovely, face-to-face encounters. Captivating! Each photo is replicated in thumbnail size in the end pages and attached to a short photographer’s note telling more about it — and these are really interesting! Ages 2 and up can enjoy the book; the added notes will suit mid-elementary and older. Check any one of them out and soak in the beauty of our world’s diversity. At any given time, in the twenty-four different time zones around the world, people are going about their daytime and nighttime, morning and afternoon-time, dawn and twilight activities. Check in on 24 locations to discover a sampling of what’s happening all around the globe right now. Perky illustrations are alive with details to spy as the hours unroll in the pages of this happy catalogue. A sunny treat for ages 3 and up. This darling, pocket-sized book is another treasure from Wide Eyed. I am gaga for all their atlases! See more of them here, here, and here. Why do the tallest mountains and longest rivers get all the attention? It’s time to focus on the small stuff, from intricate model villages to snow globe museums, the world’s smallest postal service and its tiniest frog. Spectacular illustration work as always from Lucy Letherland along with pint-sized bits of text scoot us around the globe on the search for small. Ages 4 and up. Have you heard of the surfing and skateboarding mice off the Gold Coast in Australia? Or the Night of the Radishes celebration in Oaxaca, Mexico with intricate sculptures carved out of large radishes? Middle graders who gobble up trivia will enjoy browsing through 90 pages of maps sprinkled with all sorts of outlandish details about the things people do and the strange sights one might see all over the world. This is a coffee-table book loaded with gorgeous full-page photos of children the world over. Hundreds of ravishing, professional shots from an award-winning photographer capture the beautiful faces and fascinating environments these children call home. Captions tell where in the world this is and most times a tiny bit of what’s going on in the photo, but beyond that there’s no text. Just face-to-face encounters with a magnificent variety of cultures. My one issue with this book is that there is scant diversity among the photos of children from the U.S. There are a few of Native children (which is most welcome); only one of a Black American child; the rest are non-urban, white, middle-class kids. That pained me greatly, but does not mean I don’t highly recommend the book for its extraordinary polish and global reach. I’d share this with kids as young as 2, just leafing through and talking about the pictures together. Great springboard into further reading. This survey of the immense variety of dwelling places people call home will suit children with longer attention spans than some of the easier picture books. Short paragraphs explaining everything from an underground opal mine community in the Australian Outback, to a capsule hotel in Japan, to reed houses floating on the surface of Lake Titicaca in Peru are accompanied by small but vivid photos. This book isn’t just about seeing different houses. You will also learn a little about why houses might be built underground or built with mobility in mind; find out how available materials and environments impact the way homes are built; discover all kinds of innovations to tackle disaster-relief or homelessness. Brief, interesting, thought-provoking for kids ages about 6 or 7 and up. This is one in a series of books published in conjunction with Oxfam, an international association of charities working to eradicate poverty around the globe. I really like what they’ve done. It is similar in concept to the first book in today’s post. They first dispatched photographers to spend time with six families around the world. Each family has a child around the age of 7. The photographs of these families accompany short narrations telling how they go about their days and especially their relationship with water. With families in arid Ethiopia and Mauritania, as well as flood-prone Bangladesh; families in the mountains of Peru and Tajikistan, and in the city of Los Angeles — the way they obtain water, the amount of water available to them, and how they use water, are all strikingly different and thought-provoking. You can read the review here, if you wish. It’s the exact same format as this book. You can find lots more books like these surveying global schools, homes, grandparents, languages, and more in my Subject Index. Scroll down to Cultures and look in the section called Multiple Cultures. Every title is linked to its review. Don’t want to miss a single stop on the tour? Follow the blog and the posts will be delivered to you by email. Know someone who would love to travel with us? Share this post via social media or word of mouth. What an unbelievable resource. Thanks so much!